Hollywood (/ˈhɒliwʊd/ HOL-ee-wuud, informally Tinseltown /ˈtɪnsəlˌtaʊn/) is a neighborhood in the central region of Los Angeles, California. The neighborhood is notable for its place as the home of the U.S. film industry, including several of its historic studios. Its name has come to be a metonym for the motion picture industry of the United States. 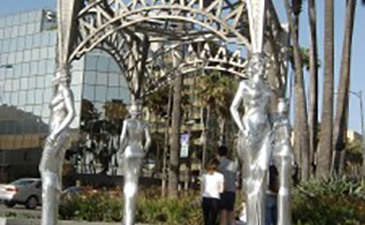 Hollywood is also a highly ethnically diverse, densely populated, economically diverse neighborhood and retail business district.